The 1950s retro revival bathroom looks very similar to the original bathroom. The remodeled bathroom has a new tub with new “vintage” tile surround, complemented by a custom contrasting maroon design. There’s a tempered glass panel at the end of the tub. New custom cabinets have two pull-out pantries for great storage. There’s radiant heating under the new tile, and a powerful but quiet exhaust fan. Although the bathroom is new, its 1950s “Art Deco”charm has been preserved, and the color scheme has been retained. was drafty and cold. The steel tub was getting rusty, and the shower walls were leaking. There was an unsafe glass panel at the end of the tub, not tempered. Original cabinets didn’t have good storage. The lighting and ventilation needed improvement. The remodeled bathroom has a new tub with new tile surround. There’s a tempered glass panel at the end of the tub. New custom cabinets have two pull-out shelving units for great storage. There’s radiant heating under the new tile, and a powerful but quiet exhaust fan. 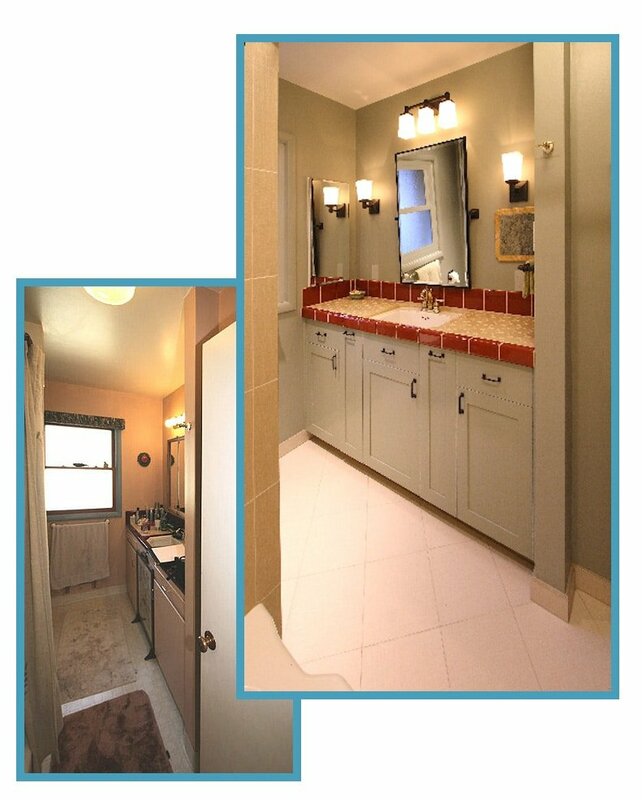 Although the bathroom is new, its 1950s “Art Deco”charm has been preserved, and the color scheme has been retained.